Integral to the food chain, tiny shrimp krill are the primary food source for many marine mammals and fish. What about the millions of krill swallowed in one gigantic gulp by a hump back whale? The krill's purpose in life is to provide food for a hump back whale? Ok.
Then what is important about the life of a hump back whale? What is the whales' purpose in nature? To procreate for the survival of the hump back whale species. Why? Whales are neat and provide jobs for research scientists and National Geographic photographers, but there must be something besides that. And are the krill appreciated? Only by the whales and other marine animals. Krill are the low end of the food chain, along with plankton and algae. So what? What do we care about krill and the food chain? 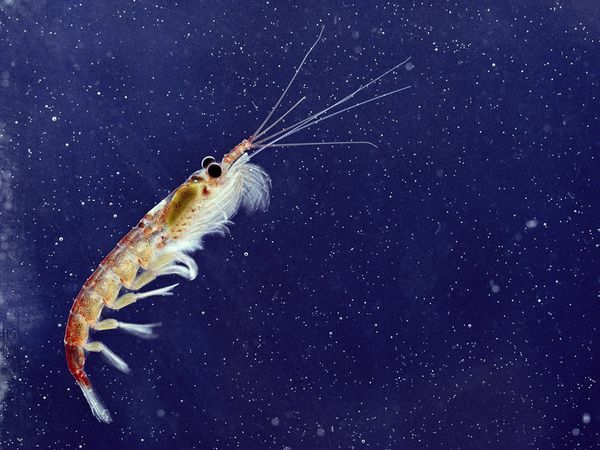 Ergo, the purpose of krill is to feed humans. What, then, is the purpose of humans? Ordinarily, I don't care what you think, but just for awhile, if this really provokes your brain to activate, e-mail me. I might be interested in your opinion. Or not.